Rainbowed Namtar's tonight with Dwarf Rogue on Vicious. The 3rd, 4th, and 5th forms were a lot stronger than I was expecting them to be, but I got it after two tries. This was Binlor => TT, but without PISSORF. I went in with a CYDSTEPP strategy with Namtar's Ward and finding CYDSTEPP, but I was able to avoid ever going negative on piety, and was able to get Tikki's Edge, Dodge, and 4 Reflexes. So that is vicious token down, only goat person, vampire and monk left for rainbow. I went for traditional pissorf strategy. I tried as Orc, Dwarf and Goblin Cruseder and Goblin chemist too, but I got alot of problems with namatar's 4th form. He had such high damage and health, I almost got past it as the goblin chemist, but again I did not have the resources. 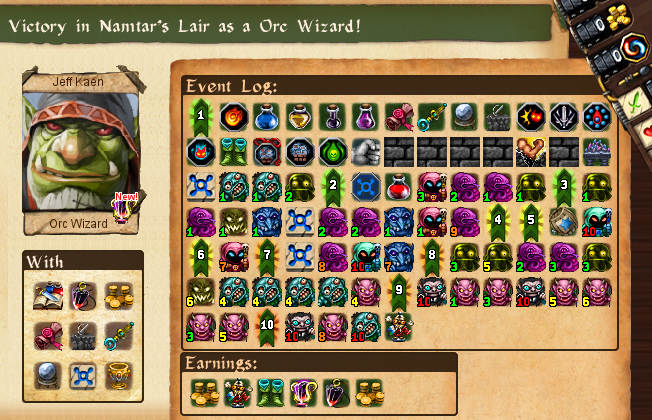 As the orc wizard, with pissorf strategy I used up every resource I had, except for blackspace. After attempting to beat namtar's lair with vampire, goatpersone and monk the last 3 days, my attempts has not yeilded any results. Please send advice. Lynzkar wrote: After attempting to beat namtar's lair with vampire, goatpersone and monk the last 3 days, my attempts has not yeilded any results. Please send advice. Monk: I think the easiest way is probably to go Orc of Binlor, farm magic resistances until you're close to the res. cap, and just brawl Namtar into submission. You can fool around with PISORF but since you have potions to clear the Poison, you can probably just melee form 1 in 2 or maximum 3 takes. Goat: I definitely recommend a Yendor prep. It trivializes the level unbelievably. Just pop it at L1 (or if the starting area looks promising, go as far as you can go effortlessly, and pop it once you feel it starts to get harder). Between the restorations afforded by your conversions (you can't bring more than 4-5 items down so you will convert), you should be able to blast Namtar away. Of course, as with always, no-RNG screw-up helps immensely (I'm thinking altars mostly). I'd prep Mystera to have at least one safe altar and see where that leads. I wish I'd taken screenshots, so I could remember what I did recently. Monk was my final class. I'm pretty sure I brought in Elven Boots and Binlor, and got Stone Fist. I regen-fought Namtar's first form with APHEELSIK, platemail, soul orb, and health potions. Second form, I'm pretty sure was all fireballs. I remember the trolls being great food for the vampire. I'm getting close to rainbowing Demonic Library now (leaving only GT, VGT, Dragon Isles, and Naga City). I'm surprised how easy DL has been. I've gotten wins on my first try for the 15 classes I've tried so far, including a horribly played bloodmage. I'm not looking forward to the half-dragon though. I found demonic libary to be rather easy too, atleast once you have learned all it's tricks. I still have not managed to beat namatar's with goat, monk and vampire. I have sort of given up, and might head to dragon isles or naga city prematurely. Yeah, DL is relatively easy now. Used to have 444 HP on all the minibosses (and higher damage? IIRC and I think Avatar spawned plants rather than his current XP minipacks), which put a lot more of the challenge topside. Took me about a week to Vamp. Now I think it can be spiked to death without much issue and the topside is more of a gold/XP generator than a challenge if played right. Half-Dragon really should be fine, you more or less have a guaranteed thing to Knockback Avatar into (as well as easy-times positioning him to keep the topside accessible) and the mixed damage helps with the topside bosses. I'm thinking of taking in JJ and doing some topside demon lord skittles. Yeah, half-dragon was a lot easier than I thought. He got many easy kills on avatar spawns, and that let him level a few times during the fight. Half-dragon, chemist, and rat took two tries. The rest took one try.